The Dream Blaster by Mad Catz is a third-party light gun for the Sega Dreamcast. 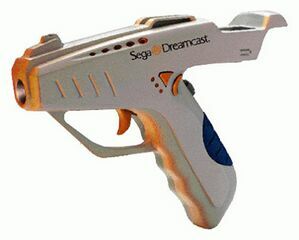 Though once intended to be a cheaper version of the official Dreamcast Gun, the Columbine High School massacre led to Sega pulling their own light gun out of North America in favour of Mad Catz's, thus the Dream Blaster became an official Dreamcast accessory in that region. Elsewhere the Dream Blaster was licensed by Sega, but remained a third-party alternative. The Dream Blaster is functionally identical to a regular Dreamcast Gun, though may have been chosen by Sega for its aesthetics (i.e. it doesn't look like a real gun). There is a row of LED's that flash with each pull of the trigger.